Metal artists John Stewart Jackson and Joe McCreary (UA MFA 2011) will showcase their work at The University of Alabama Gallery in the Dinah Washington Cultural Arts Center, June 1-29, 2018. Between them, the artists have almost four decades of experience in the art and craft of working in metal. During the last 20 years, Joe McCreary has exhibited his work in solo and group shows and been included in several permanent collections. 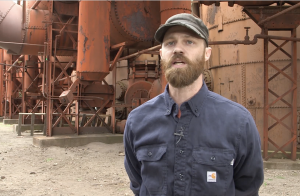 McCreary was artist-in-residence at Sloss Furnaces National Historic Landmark for 12 years. Visitors to UA campus know McCreary’s work through Goldie 1971, part of the Woods Quad Sculpture Garden, in the collection of the UA College of Arts and Sciences. 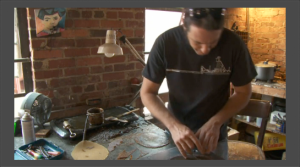 For the past 15 years, McCreary has introduced artists to the process of casting through his introductory sculpture classes at The University of Alabama and at the University of Alabama at Birmingham. He has been a visiting artist at Birmingham-Southern, Alfred University and UAB. McCreary holds an MFA in sculpture from The University of Alabama and a BA in art education from the University of Southern Mississippi. His work deals with issues of scale, history, food, and humor. 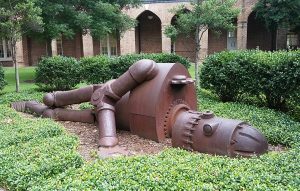 After studying sculpture at Birmingham-Southern College, John Stewart Jackson spent six years as a resident artist at Sloss Furnaces National Landmark in the Metal Arts program, Sloss Metal Arts, specializing in cast iron sculpture. In 2006, Jackson moved to Singapore to serve as a curriculum specialist and sculpture teacher for School of the Arts (SOTA) for seven years. Returning to Birmingham in 2013, Jackson now works full-time on public art commissions, private commissions, and gallery exhibitions. Jackson’s art website is https://johnstewartjackson.carbonmade.com/. Both artists’ works will also be featured at Stephen Smith Fine Art in Fairfield’s In the Belly of the Beast – Second Degree, a national metal casting exhibition that includes UA art alumna Claire Lewis Evans (MFA 2015), June 29-August 25, 2018. More information can be found here: http://www.firstfridaytuscaloosa.com/art-galleries/dinah-washington-cultural-arts-center-galleries and on the UA Gallery page: https://uagallery.as.ua.edu/. The Dinah Washington Cultural Arts Center is located at 620 Greensboro Avenue, Tuscaloosa. It is open Monday-Friday, 9 am-5 pm and closed Saturday and Sunday.